Engineering @ Business: A $100 laptop?? 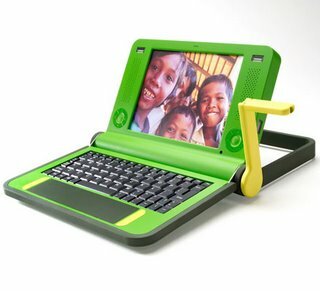 One Laptop per Child (OLPC) is a non-profit association dedicated to research to develop a $100 laptop—a technology that could revolutionize how we educate the world's children. This initiative was launched by faculty members at the MIT Media Lab. It was first announced by Lab co-founder Nicholas Negroponte, now chairman of OLPC, at the World Economic Forum at Davos, Switzerland in January 2005. The MIT Media Lab's research initiative revolutionizes how the world's children are educated by working with local ministries of education to distribute one laptop per child. The biggest hurdle was designing a genuinely useful computer that could feasibly be built for $100. At the same time, because the computer will be used by children in a wide variety of environments, the device needed to be very robust and able to operate off the grid with a hand-cranked on-board generator. The laptops will have wireless broadband that, among other things, allows them to work as a mesh network to create an ad hoc, local-area network. Because the system will be distributed throughout the world, its aesthetic is culturally neutral while appealing to children from five to fifteen. The design has been a huge public relations hit, and several partners have come on board. Red Hat will produce software, Taiwan's Quanta will manufacture the machines and AMD will supply the processors. The first 5 million units will be shipped to China, Brazil, India, Argentina, Egypt, Nigeria and Thailand by the end of the year.